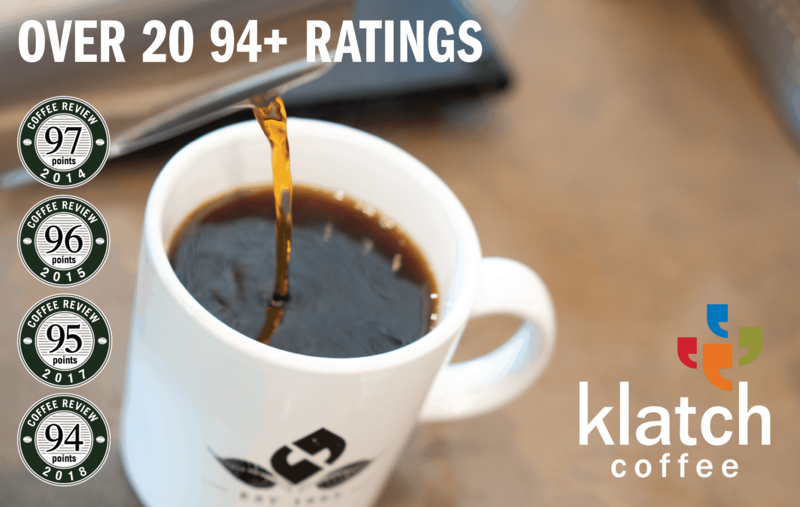 Coffee Review’s list of the Top 30 Coffees of 2015 appears below. We selected and ranked these 30 notable coffees and espressos from the thousands we cupped throughout the year. The rankings are based on quality (represented by overall rating), value (reflected by most affordable price per pound), and other factors that include distinctiveness of style, uniqueness of origin or tree variety, certification, and general rarity. Immense, sweet, juicy, intricate. Lilac and jasmine, peach, apricot, rosehip, much more in aroma and cup. A vibrant but unobtrusive acidity shimmers in the heart of the sweetness; mouthfeel is satiny, full, almost nectar-like. Flavor, particularly the crisper notes, carries deep into a sweet, peachy finish. Invitingly complex, vividly expressive. Starfruit, musk, butterscotch, dark chocolate in aroma and cup. Lyric, gracefully coherent acidity; ultra-silky mouthfeel. A full complement of flavor notes carry deep into a long, resonant finish. Complex, pungently juicy. Rose-like flowers, roasted cacao nib, candied lemon, mulberry in aroma and cup. Sweet-toned, softly lively acidity; plush, satiny mouthfeel. Deep and flavor-saturated in the finish. Extraordinary authority and complexity. Honey, complexly-expressed flowers – lavender, lilac – candied grapefruit, underlying suggestions of sweet herb. Sweetly and richly bright acidity; buoyantly syrupy mouthfeel. Finishes with immense sweetness enveloping a crisp, drying edge. Intricate, exhilarating; crisp yet juicy. Honey, roasted cacao nib, tangerine, sandalwood and very complex flowers, particularly rose and jasmine, in aroma and cup. Juicy, gently tart acidity; plush mouthfeel. Flavor consolidates but persists in a long, sweet, resonant finish. Evaluated as espresso. Delicately yet vastly intricate; crisp yet lush. Buttery chocolate, deeply sweet, lilac-like flowers, pungent sandalwood in aroma and small cup. Light, silky mouthfeel; flavor consolidates but rings on in a richly drying finish. Complex and complete in three parts milk: buttery, fruit-toned chocolate, a continuing shimmer of flowers. The intoxicating spirits-rich aromas of the cask dominate in the nose, but a fine coffee character emerges in the cup to balance and support the casky rum notes with suggestions of dark chocolate, vanilla, raspberry, almond, passion flower. Smooth, rounded acidity; plush, buoyant mouthfeel. Very long, resonantly flavor-saturated finish. Evaluated as espresso. Distinctive but extraordinarily complete and balanced in structure. Dark chocolate, black cherry, violet, oak in aroma and small cup. Full, nectar-like mouthfeel; sweet, violet-toned finish. Big, rich presence in three parts milk: floral chocolate and a buttery nut note. Delicate but extraordinarily intricate. Passion flower, orange, loquat, sandalwood, frankincense in aroma and cup. Sweetly bright, juicy acidity; light, silky mouthfeel. Flavor resonates far into a long finish with very little loss of complexity. Sweetly and deeply pungent. Black currant, tangerine, roasted cacao nib, lily-like flowers, a hint of savory black sage in aroma and cup. Lyric, balanced acidity; full, cushiony mouthfeel. Resonant, flavor-saturated finish. Delicately sweet and exotically spicy. Tea rose, cocoa nib, cedar, frankincense, much more in aroma and cup. Dynamic and expansive acidity; satiny mouthfeel. Rich, resonant finish infused with musky floral notes far into the long. Evaluated as espresso. Deeply and roundly bright, balanced, complete. Cedar, blood orange, apricot, baker’s chocolate, a hint of lily in aroma and small cup. Syrupy though buoyantly lively mouthfeel; orangy chocolate and a hint of lily carry into a richly sweet finish. Fills out three parts milk with authority: orange- and cedar-toned chocolate, hints of lily and stone fruit. Very sweet, exhilaratingly floral, lavishly complex. Lavender honey; floral notes ranging from violet to lily; candied lemon and blood orange; roasted cacao nib; black cherry in aroma and cup. Delicate, gently crisp, very sweet acidity; syrupy, buoyant mouthfeel. Deep, long, resonantly flavor-saturated finish. Pungent, layered, deeply complex. Blackcurrant, dark chocolate, lavender, orange zest, fresh-cut maple in aroma and cup. Vivid, brightly sweet acidity; light but silky mouthfeel. Round, ringingly rich finish, saturated with flavor. Evaluated as espresso. Sweet-toned, round, deep. Dark chocolate, roasted almond, ripe fig, lily, oak. Full, syrupy mouthfeel. Chocolate and fig in particular carry into a resonant, balanced finish. Fills out three parts milk with authority: more rounded fig, chocolate and lily. Intricate; lushly fruit-forward and round. Lilac, tangerine, almond butter, Cognac and ultra-fine musk in aroma and cup. Juicy, richly floral acidity; silky, levitating mouthfeel. Crisp, sweet, long-lasting finish redolent of musk. Deeply sweet, lyrically balanced. Honey, honeysuckle, hazelnut, cacao nib, crisp pear in aroma and cup. 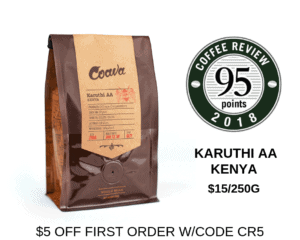 Gracefully and gently brisk acidity; silky, buoyant mouthfeel. The sweet honey/honeysuckle and the crisp cacao nib and hazelnut notes carry into a quietly flavor-saturated finish. Crisply sweet, deeply and exhilaratingly intricate. Orange blossom, ripe raspberry, roasted cacao nib, sandalwood in aroma and cup. Brisk but juicy, complexly nuanced acidity; smooth, satiny mouthfeel. Flavor consolidates but resonates in a long, echoing finish. Delicate, sweetly pungent, spicy. Crisp peach, black tea, magnolia-like flowers and lemon zest in aroma and cup. Juicy, bright acidity; lightly silky mouthfeel. Peach, black tea and floral notes carry deep into a crisply sweet finish. Richly sweet; layered complexity. Pomogranate, narcissus, round, caramelly chocolate, a pungent hint of pine in aroma and cup. Balanced, lyrically lively acidity; plump, satiny mouthfeel. Chocolate and a hint of pine in a lightly drying finish.